I know that my posting lately has been spotty and inconsistent, and for that I'm sorry. I'm not sorry enough to promise to change, or to propose counseling for us because I know in my heart of hearts, that it will probably happen again, and I don't want to make a habit of lying to you. Don't worry, I haven't been cheating. I'm not spending my mornings reading other blogs or secretly posting my typical self-deprecating thoughts on other Internet publications. No, instead I have been suffering through two weeks of gratingly bad behavior from my children that has left me, in every quiet, all-to-brief moment, looking for places to hide in my house or at the very least, plotting my future escape. Belize might be nice this time of year. Heck, I'd settle for Siberia if it meant I could sleep past 7am. My poor husband has had to endure the brunt of my frustrations, walking in the door at the end of a very long day just in time for me to lock myself in the bathroom just to remember what it used to be like to pee alone, in silence. I love the boys, of course, but I can't help the sneaking suspicion that I'm getting worse at this motherhood thing instead of better. I like to play the blame game with myself at night when I should be sleeping, thinking, "If I was doing my job right, Cael wouldn't misbehave so much." Or I berate myself about Graham, wondering, "Is Graham's unwillingness to wear pants a reflection of how badly I've already warped his tiny mind?" Man, I'd kill for some chocolate. That chocolate part doesn't relate, but I'm thinking it most of the time anyway. Thanks for sticking with me and what may seem like my recently abandoned blog. There may be days when I don't post here or there, but if you are one of the remaining few that keeps coming back to listen to my mental ramblings, know that you've brought a smile to my day. "Mommy, what's wrong with this show?" "This show on Netflix. Where's the color?" "Oh, it's just an old show in black and white. That's what TV used to look like a long time ago." "Is that what you watched?" "No, I watched mostly color TV. But there were a couple of shows like Lassie and Dennis the Menace that I watched in black and white." "Yeah. You're really old fashioned, Mom." Just wait until I tell him I'm older than the Internet. I think this is my least favorite part of the year. As a parent of boys that don't easily tolerate the cold, the string of days spent inside the stuffy house blur together into one chilly, endless day. As the wife of a teacher, this time is too far removed from winter break to remember longingly and too far from spring break to feel any anticipation. And as a person who loves good food and will probably always be on a diet, this time of year means an excess of one thing: Girl Scout Cookies. When I was young, I was a Brownie but never graduated to full Girl Scout status. I found that my days were already full with bike rides, night-time games of Capture the Flag and lightning bugs in mason jars. And no, I didn't grow up in the 1950's; I grew up in Iowa. Because my schedule was already at capacity, I never felt that I missed out on an opportunity to proudly wear a sash and ascend the scout ranks. In fact, very few of my friends participated in the organization either, so I have been overwhelmed to discover that every young girl I currently know, in my town or any other in America, is hocking delicious cookies with surprising intensity. I've been propositioned at my door more than ten times. I've been stopped by aggressive children camped out at the entrance of every grocery store in my county. I've even received private messages on Facebook urging me to indulge in just one more box. Just one more box? We've already polished off twelve. And while I have proudly maintained willpower against those blessed Peanut Butter Patties and Thin Mints, no one has embraced Girl Scout cookie time more than Cael. "Mommy, when can I sell cookies?" "Do you want to sell cookies, or do you just want to eat a bunch of cookies?" "I want to eat all of those boxes of cookies. I'll be a girl for a while if I can get all of those cookies." "I don't think that's necessary, Cael. I'll just get some each year when they sell them, and if you're a good boy, you can have them as a treat." "They don't sell the cookies all year?" "No, just at special times." "Then I want it to stay this time all year." "Really? You want it to be cold and snowy all year long? You don't want to play outside again or go swimming? Have to wear a coat and hat all the time and not get to ride your cars in the yard?" He had to think about that for a little while. Rolling in the dirt in shorts and splashing in a Slip 'N Slide is part of his DNA. Not the only part of his DNA, apparently. Yeah, enough said. Maybe February isn't that bad. "Mom, why is Graham so grouchy?" "I don't really know, Cael. Probably because of the medicine he's been taking." "Why did you give him medicine that would make him feel bad?" "That's just a side effect. The medicine makes his lungs stronger so he doesn't cough or have trouble breathing. But sometimes medicines do other things that we don't like while they make us better." "And that's why Graham is grouchy?" "Oh, okay. I thought it was because I punched him in the leg. I guess not." It was about a year and a half ago that I re-wrote the book on oral steroids for children and told it like it is. Or was, in this case. But what I neglected to consider at the time was that Cael, responding to the medication like a crazed killer set on ruining me psychologically, one day at a time, might be in the minority. Perhaps most children respond to Prednisone minimally, and maybe some don't respond at all. Still others might respond like Graham. I fully expected a five-day course of oral steroids to turn my sweet, quiet(er) boy into a raving, thrashing lunatic like it did his brother. But instead, Graham has reacted with dramatic, Britney Spears-grade emotional instability and moods swings that would put a pregnant woman to shame. "Graham, I made banana bread. Do you want some for breakfast?" "Yea! I love banana bread! Yummy!" "On a blue plate? A blue plate! No! I want a purple plate! A PURPLE PLATE!" "Wow, you don't need to be so angry. The purple plate is in the dishwasher, so this time I have to give you a different one." "What? It's in the dishwasher? Noooo!" (sobbing) "I only want the purple plate. Mommy! Nooo....!" "I'm sorry that makes you unhappy, but I'm not going to give you a dirty plate. You can have a blue plate or a green plate." "Green? Yea! A green plate! Thanks, Mommy!" Mercifully for me, this conflict was only about a colored plate, so you can imagine the obscenely dramatic scene that unfolds when something of any consequence takes place. He kicks. He screams. He cries. I berate myself for preferring the wheezing. But mostly, I feel relieved by the knowledge that the medicine is gone and I will, someday soon, get my son back. All ten fingers, ten toes, and all fifteen of his personalities. Music is in our blood. Both Joel and I grew up in musical homes, and with Joel's career in the same field, it is no surprise that our boys would have a unique appreciation for music. Joel's interests lie with vocal jazz, and Cael and Graham know that when riding in his car, they should expect to be serenaded by Ella Fitzgerald and Diana Krall. But my musical taste is much more eclectic. If I'm cooking lunch, it is highly likely you'll hear me recreating the soundtrack of Les Miserables. If I'm in a sour mood, the rest of the country and I look to Adele for comfort. But in the car, my phone provides a bizarre mix of genres that fills our ears with music. When I compiled these songs, I divided them into two categories: workout music with a fast beat or language my children shouldn't hear, and "for the car" music that I carefully screened for profanity. For months, the boys and I have listened to these songs with no problem, save for Graham's constant request to hear "Just the Way You Are" by Bruno Mars. They have their favorites, just as I do, and I took requests without concern because I had thoroughly checked each song for offensive language. But children hear everything-- not just profanity, right? "Mommy, what does 'make love' mean?" Holy cow. How on earth did I not think about checking for content? How come he hasn't asked about this during the last year? How am I going to explain this one? I could have told him the truth, but the kid is only five. And moreover, he is inquisitive, and one question would lead to ten more, and it is simply too soon to be explaining the intricacies of relationships and birth control to my preschooler. "The singer just means 'love' in this song. He loves the girl he's singing about." "Oh, okay. Then I 'make love you', Graham! And I 'make love' Daddy, and Papa, and you, Mommy! And Amy, and Sarah, and my friends at school. I 'make love' all of the people I know!" Anyone know where I can find a good nursery rhyme song compilation? I hope you all had a great Valentine's Day, friends! Mine was very eventful; filled with paper hearts, sprinkle-coated cookies and a late-night trip to the emergency room. I had intended some blog silence on Thursday as it was a holiday, but it was the near all-nighter I pulled on Thursday night that was the reason for my sudden and unexplained internet absence. 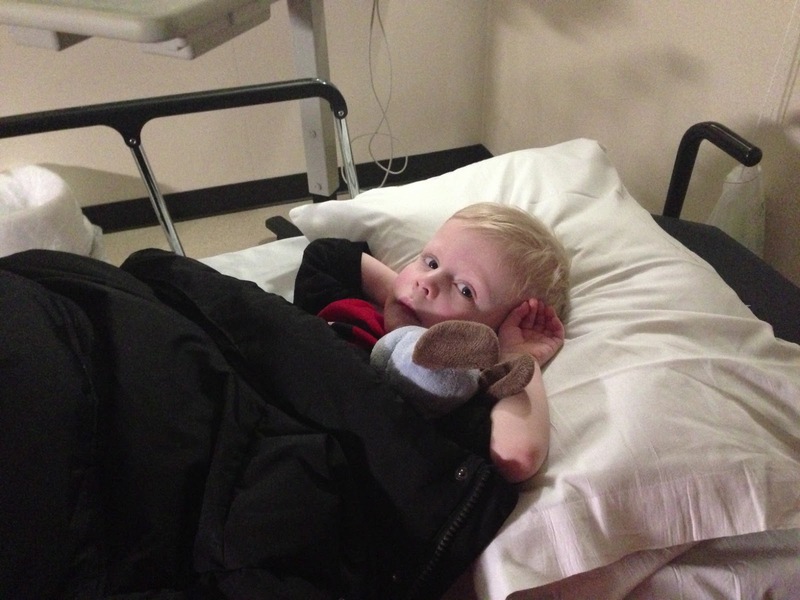 Graham's latest adventure in illness was a fast one. When he woke up on Thursday morning, he was 100% healthy. At lunch time, he let out one cough that was my only indication of what was to come. By bedtime, his cough had turned to croup, and his head had turned feverish, so I tucked him in bed with Tylenol and a vaporizer and hoped for the best. There was never any hope, though. It was a holiday, and in my home, holidays always spell disaster. Around ten o'clock, while Joel and I were watching television, I heard a funny sound on the boys' monitor. My gut told me that I wasn't hearing snoring, or Cael talking in his sleep, so we sneaked into the dark room and listened to the sound of Graham's wheezing. I'd never heard that sound from either of my kids before, so we had to make a few phone calls to assess the severity of our situation, and everyone agreed that we needed to be seen immediately. So, shortly before eleven, a very snuggly and pathetic Graham and I headed into the hospital. But as all kids seem to do, it was that moment that Graham decided to "turn it on". With the exception of a low fever and some minor wheezing, my boy appeared to be the picture of health, singing along with Disney Junior shows that ran all through the night and, like cockroaches, I suspect would be one of the only things remaining after a nuclear holocaust. We took a chest xray, were introduced to the nebulizer, and after thwarting any hope of a full night's sleep, received our discharge papers at two-fifteen in the morning. Our return home brought with it the return of Graham's weepy, whiny and tired demeanor, and his steroid prescription has served as an extra insurance policy that today, another holiday, couldn't go too smoothly. So please accept my apologies for going MIA last week, and feel free to pass on any positive thoughts for the holidays to come. Valentine's Day hasn't yet arrived and I've already overdosed on all things red and heart-ish. The exhaustive efforts I've put in to this Hallmark holiday have left me bitter and uninspired, which is ironic because I was aiming for uplifting and creative. It all began with a simple request from Cael's teacher that the kids' valentines all be handmade (by the children themselves) and not a store-bought onslaught of media characters and canned greetings. While I like the idea, I immediately knew that this could be a challenge for my family, because while Cael does enjoy coloring and cutting things out of paper, his attention span for said activities is even shorter than the blade on his safety scissors. I began by asking Cael what he'd like his valentines to be. "Then I want to give everyone a wood box with lots of presents inside. And cookies. And a bunch of money." I wasn't really sure how to make his mustache theme work, but it was the more viable option he'd listed, and I knew that I had to make it happen or I'd wind up whittling a wooden box from a solid piece of wood, and then stuffing it with my own hard-earned money. And cookies that my diet won't even allow me to eat. We started our search on Pinterest, where we found a few cute mustache-themed ideas. Cael really liked the mustaches on a stick that could be held up to one's face to make it look as though they had an abundance of facial hair. 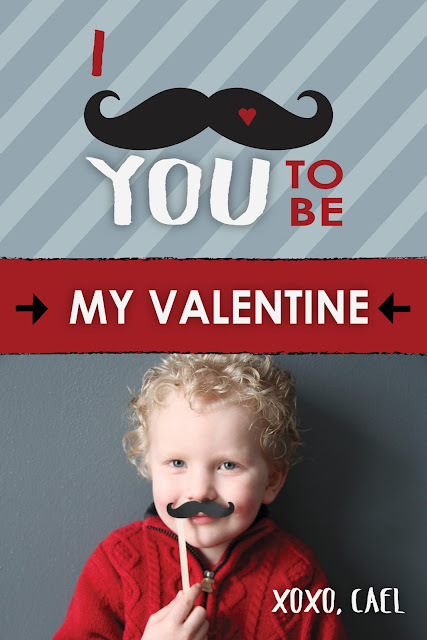 I liked the homemade card that read, "I (mustache) you to be my valentine." 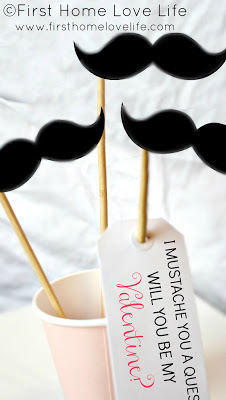 And because a mustache on a stick wasn't quite sufficient, we decided to make both. I recognize that a glossy, highly-designed photo card didn't necessarily qualify as my son's handiwork, but I justified this by letting Cael make all of the decisions, choose the photo we'd use, and do the grunt work of glueing the photos to the paper backing. When it was time to construct the paper mustaches, we quickly found that it was a task too advanced for Cael's scissor skills, as he consistently turned out mustaches that looked more like fish or worms than actual facial hair. When he was totally defeated and we'd wasted nearly $5 in cardstock, I took over the 'stache trimming duties and put Cael to work decorating the sticks and glueing them to the paper mustaches. The next day, I tasked Cael with writing his name on the back of the valentines, one of the harder jobs but one that I knew it was important for him to do himself. I was pleasantly surprised by how well and clearly he was able to sign the valentines. He was so good and so consistent that I just knew we'd have complete success writing the other children's names on the envelopes that held their somewhat Cael-made valentines. Holy Cupid, was I wrong. Cael's writing skills are probably right on par for his age. He recognizes all of the letters and a few short words, but he hasn't had much practice writing out different combinations of letters, so all of the names (save for his own) were unrecognizable and foreign to him, leading him to believe I was tricking him into writing other words that his teacher wouldn't appreciate. "Mommy, why did you put a 'dot' after M-R-S?" "Because those are the letters we write for the word 'Missus'. It's called an abbreviation, and we use it so that we don't have to write out the whole word." "That's not right. This says 'monkey'." "No, I promise it doesn't." "And this one says 'chicken'!" After Cael's paranoid barn-animal illusions had passed, his frustration multiplied exponentially with each new name. He was frustrated with the letter "N", and I was frustrated by his refusal to write large enough to make the names readable. Sometimes he ran out of room and got marker all over the countertop, and sometimes I was impatient with my son's inability to accomplish anything faster than at a snail's pace. After the names were finally written, we left the valentines at the counter and walked away, angry and exhausted. All that was left was to stuff the decorated valentines and stick mustaches into the envelopes that Cael had labeled, and my greatest Valentine's Day wish was that he could accomplish that task on his own without the two of us arguing about it and quickly enough that they would be completed before summer break. But sadly, the envelopes proved to be the most trying part of the entire ordeal. If I had only put the envelopes in alphabetical order, most of the first seven envelopes that he destroyed would have been for short, easy-to-write names. Instead, three of the seven he ruined were for teachers with abbreviated titles and, according to Cael, monkeys. So on Monday night, when I found myself up in the wee small hours of the morning stuffing valentine envelopes, I knew that it was for the best. Because if Cael and I hadn't made these homemade valentines together and opted instead for Hulk's aggressive expressions of love, I wouldn't have learned the most important lesson of all-- sometimes the more involved and heartfelt the effort, the more my son and I want to pile drive each other into the sofa. So Happy Valentine's Day, friends. May your store-bought greetings bring love to your lives, and mustaches to your faces. This past week has been "Operation No TV" in my house, and while the boys don't generally watch much television during the day when I have other kids in my house, I do frequently put on one Mickey Mouse Clubhouse or Curious George episode while I put my youngest charge to sleep for her morning nap. I have found it to be a much better alternative to three yelling, stomping boys circling outside her door in an angry frenzy until I emerge and inevitably return to her room for attempt #2 after their noisy outbursts. But I didn't have the baby last week, so I resolved to shut off the programs and try some extra physical and creative activities to fill the day. The Play-Doh party was well-received, but short lived as soon as Cael's realized he wasn't as experienced a sculptor as he had hoped. The obstacle course was just plain bad foreshadowing on my part. The couch cushions and my ear drums are still in recovery. But the jumbo fort-- the one I constructed from all of our vinyl pop-up tents and blankets-- was the ticket. The boys could barely hold still as I contructed it, itching to wriggle beneath the blankets and into the various rooms it contained. I wish I could say that the fort lasted as long as it took me to construct, but the boys must have been reenacting the twister scene from "The Wizard of Oz", because within seconds there were blankets and pillows flying through the air, and the entire structure came down with a whoosh. So we started again. I "fortified" the tents with strategically placed furniture junctures and a bungee cord. I used two tents in place of one and arranged items beneath the fort ceiling to keep the roof aloft. The tin man Graham staked his claim on the "attic room" while the scarecrow Cael thought it best to remain close to the exit in case of another collapse. But this time, my efforts paid off. The fort held strong for an hour while the kids tunneled in and out, dumping toys inside and imagining my efforts to be a cave, a tee-pee or a ocean liner. And by the time the fort drooped to the floor, the sun was down and the day was done. "See, wasn't that fun? You didn't even miss the TV!" "You're right, Mom. But now it's time for your iPad. Please?" I think that all parents consider their children to be not only smart and funny, but the perfect combination of genes to create the most aesthetically pleasing face on earth. I know that I do. But this time, I know I'm not the only one. I got a message from a friend that she'd seen my son's face on an advertising flyer for the school pictures to be taken at the preschool Cael attended last year, so I quickly darted over to see for myself. Cael, along with three other beautiful faces, was chosen to represent the best of their work and the potential beauty that one's child could display. That's what they would have you believe, but we both know that Cael is in a league of his own. Today, photography, tomorrow Old Navy. "Mommy, when you're in a library, why do you have to be quiet?" "Because people are trying to read, Cael, and it's hard to concentrate when people are being noisy." "So you always have to be quiet everywhere you go?" "Well, always in a library. But you should just follow the rules of the place you are, because they might be different. You know, 'when in Rome'." "Yep, that's right. Always be quiet when you're in a dome." If I am begged for hot chocolate with marshmallows one more time, I just might snap. I'd be a bit more sympathetic and patient if my kids just really liked it, but somewhere along the line they got the impression that the mere presence of snow on the ground entitled them to a steaming cup. So when I ran out of the prepackaged drink mix, I feigned ignorance about how to make it from scratch and searched the recesses of my mind for another winter treat that the boys could get excited about. But as I looked around the kitchen, there wasn't much to find. All of the Christmas candy was long gone, save for one smashed mini candy cane that had seen better days, and an odd number of chocolate coins that I couldn't easily divide. I remembered making snow "ice cream" for Cael two years ago, and although it was a messy mistake that time, I had since seen several recipes on Pinterest with hints for a more successful batch. So I threw on my coat and boots and headed outside for some fresh snow, far away from the dog's backyard turf. I packed a plastic container full of clean snow and let it stay in the freezer for about an hour before I worked with it. Once it was good and cold again, and nearly frozen solid, I added in milk, sugar and vanilla until the flavor was right and the texture was creamy. Although it would have been fine to eat right away, it had softened considerably so I popped it back in the freezer for 30 minutes until it had thickened up to soft-serve consistency. I scooped some into a bowl and topped it with a cookie and some chocolate syrup, and fed it to a troupe of hungry boys that devoured it in record time, awed by the new-found discovery that snow could be as delicious, if not more so, than the hot, chocolaty treat they'd come to love. "Do you like it, Cael?" I put one point on the board for me, and smiled at the thought that they might remember these special moments and silly smiles we've shared. "How did you make this brown 'mud sauce' taste so much like chocolate?" Last year at this time, I wrote a post entitled, "Everything I Know I Learned on Super Bowl Sunday", and while I briefly considered recycling that name for today's post, I quickly realized that all I learned from the game last night is that kissing can be repulsive and that even gigantic, multi-million dollar facilities still use the same old lights that were in my elementary school gym. And they still take 15 minutes to turn on. Dodge ball, anyone? But since those two facts don't take many words to convey, I thought I'd shift my focus to my kids' impression of the event, which they admittedly avoided in favor of The Lorax and an all-out war with a set of ill-advised Socker Boppers. But that didn't stop them from having opinions. "Mommy, what is the Super Bowl?" "It's the last football game of the season. These are the two best teams this year and they play each other." "Why is it a bowl? Is there a Super Plate?" Come to think of it, why is it a 'bowl'? Maybe from now on, the boys and I will arrange an annual sporting event to celebrate other kitchenware that deserves attention. I have a really nice colander that hasn't seen sunlight in several years. "Mommy, why is there so much food?" "It's fun for to have appetizers and lots of different things to eat for the Super Bowl. It's a special occasion." It's true that less is more. But sometimes more is even more more. So for the four adults we had buffalo wings, little smokies and meatballs, chicken strips, shrimp cocktail, hummus and crackers, guacamole and chips, sausage-stuffed mushrooms, fruit skewers and cheesecake shooters for dessert. "So is it a football holiday or a food holiday?" At the end of the night, and with the "holiday" behind us, we tucked Cael into bed late, but happy that he was able to stay up with the grown-ups. And we all slept with full bellies, ready to start the day bright and early this morning because my children's internal alarm clocks are atomic in their accuracy. "Mom, do I have school this morning?" "Yes, Cael. But it's still too early. Go back to your room until your sun light comes on." "But it's getting light out. It's morning!" "Yes, but I'm still tired and have a few more minutes to sleep." "I guess you shouldn't have stayed up so late on a school night, Mommy." Perhaps not. So this year, rather than letting the Super Bowl teach me some new life lessons, I'll remember to look forward to next year's Super Plate, I'll try to prepare less food for the "holiday", and I'll put Cael to bed right on time. I already have one conscience that works just fine, and it tells me that staying up one hour late won't hurt him just once. It also tells me that the image of Bar Rafaeli kissing that guy will be in my head until next year's game.